Introduction: what is open access? What does OA mean for libraries? 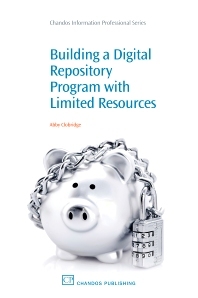 Whether you are just starting to create a digital repository or your institution already has a fully-developed program, this book provides strategies for building and maintaining a high-use, cohesive, and fiscally-responsible repository with collections that showcase your institution. The book explains how to strategically select projects tied to your institution’s goals, create processes and workflows designed to support a fully-functioning program, and creatively utilize existing resources. The benefits of taking a holistic approach to creating a digital repository program rather than focusing only on individual collections are discussed. Case studies and best practices from various institutions round out the author’s practical suggestions. Abby Clobridge is currently the Associate Director for Research and Knowledge Services at the Harvard University, Kennedy School of Government Library. Prior to joining Harvard, she worked in various academic and special libraries including Bucknell University, where she created a digital repository program, and CNN, where she worked as an investigative researcher and news librarian. Ms. Clobridge and her colleague, David Del Testa, won the 2009 ACRL Instruction Section Innovation Award for their development of the World War II Poster Project, a digital library project designed to teach undergraduate students information literacy and technology fluency skills.